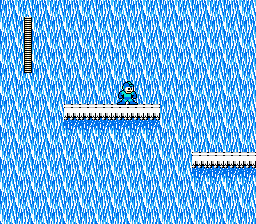 Quite simply, Mega Man II Optimum is an upgraded version of the Megaman 2 ROM. It converts the ROM’s mapper to MMC5, and its graphics format to CHR-ROM. That’s it! Unlike the Upgrade Patch done for Mega Man 1, there are no other alterations to the ROM. This is just a simple mapper and CHR-ROM conversion. The PRG-ROM was not expanded, but the CHR-ROM was maxed out to the new mapper’s 1MB limit. The ROM doesn’t need to be expanded anyway, since in the conversion of the game to CHR-ROM, all of that PRG space that stored the game’s graphics has been freed up. Also, another reason why not to expand the ROM was so that the editors made for the game could be used. Although no testing on any of the editors yet, that was my intent. So basically, there is plenty of free space in the ROM without expansion, and there is plenty of CHR-ROM space to work with. Unlike with Mega Man 1, which took three months to convert to CHR-ROM, this time it only took one month. Patch and readme included inside the zip file. 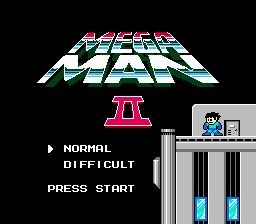 This patch is meant for the English version, Mega Man 2, not the Japanese version, Rockman 2. This ROM was tested to work on FCEUX 2.2.2. If you happen to find any bugs, feel free to contact. Thanks.